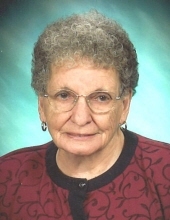 Marguerite D. Dammann, 102, of Terre Haute passed away Tuesday afternoon, March 26, 2019. She was born November 30, 1916 in Terre Haute to Charles Enoch Cade and Mary Della (Archer) Cade. Her husband, Edward F. Dammann, preceded her in death in 2003. Survivors include her children, Mary K. (Dammann) Hollinden of Indianapolis, Dorothy L. (Dammann) Austin and husband, Larry, of Waddy, KY, Edward A. Dammann and wife, Mary, of Terre Haute, Daniel L. Dammann and wife, Ellen, of Old Hickory, TN, James W. Dammann and wife, Helen, of McCordsville, IN and Christopher M. Dammann of Center Point, IN; 16 grandchildren; 24 great-grandchildren; and 7 great-great-grandchildren. Also surviving are two nieces, Barbara Jean Novak and Marie Quinn; and two nephews, Ted Hauser and Bill Hauser. In addition to her parents and husband, she was also preceded in death by two sisters, Pauline and Jesse. Marguerite was a member of St. Ann Catholic Church where she was involved in many church activities. She had formerly worked for many years in the Vigo County Voter Registration Office at the courthouse. Marguerite also enjoyed reading, camping, fishing, playing cards and traveling with her husband, Ed, when they were able. Her favorite television shows were Wheel of Fortune, Jeopardy and Cash Cab. Mass of Christian Burial will take place at 11:00 AM, Monday, April 1, 2019 in St. Joseph University Parish, 113 South 5th Street, with Friar Cyprian Uline, OFM Conv. officiating. Burial will be follow at Calvary Cemetery. Visitation is scheduled for Sunday from 4:00-8:00 PM with a Sharing of Memories at 7:30 PM in Callahan & Hughes Funeral Home, 605 South 25th Street. The family kindly requests that memorial contributions may be made Catholic Charities of Terre Haute, 1801 Poplar Street, Terre Haute, IN 47803. Service information and tributes may be found at www.callahanandhughes.com. To send flowers or a remembrance gift to the family of Marguerite D. Dammann, please visit our Tribute Store. "Email Address" would like to share the life celebration of Marguerite D. Dammann. Click on the "link" to go to share a favorite memory or leave a condolence message for the family.